As Erik Whitney recently mentioned the charming McCormick Park is now being fenced in. The plan posted at the site shows black, powder coated chain link will form the perimeter while more tasteful 4" ornamental fencing will line the path and surround the fountain. Other security-related changes include removal and changing up of some of the shrubs and grassy areas to be replaced with Oregon Grape and St. Johnswart. Looks like an archway will even be erected at the eastern most entrance. So far the Park looks pretty good though I wish the Fawcett Street facing side would have a 4" fence along it rather than the taller, completely uninviting chain link. The park is lovely right now and I recommend stopping by to see the rhododendrons in full bloom. It's a lush urban oasis that I didn't even realize stretches all the way up to Tacoma Ave. Sadly the fountain was running as a mere burble compared to my visit there last year. I'm only happy this sort of fencing fate won't befall our beloved Frost Park. by fredo on 6/3/2008 @ 10:31am Another design element which will cost untold thousands of dollars in maintenance costs over the coming years. Benefit? Well...the fence company got a sweet job out of it. by Erik Hanberg on 6/3/2008 @ 10:33am fredo--I don't think it was a design element, I think it came from the TPD budget to try to reduce some crime. by morgan on 6/3/2008 @ 10:44am This space needs a building on it. by thriceallamerican on 6/3/2008 @ 11:04am Good to know they're making sure no one will be able to access any of the grass. Can't have that. by KevinFreitas on 6/3/2008 @ 11:25am @Erik H: The Exit133 feeds show the author and I thought I saw your name on that one. If it was someone else lemme know. @morgan: Really? It's a really nice green corridor between Tacoma and Fawcett. I'm all for urban density but I kinda' hope your kidding here. by fredo on 6/3/2008 @ 11:38am Erik H@I'm all about reducing crime. That fence appears to be the same height that burglars jump over every night on "Cops". They're usually holding a color TV under each arm when they do it. Yucca plants give better deterrence and don't rust out. 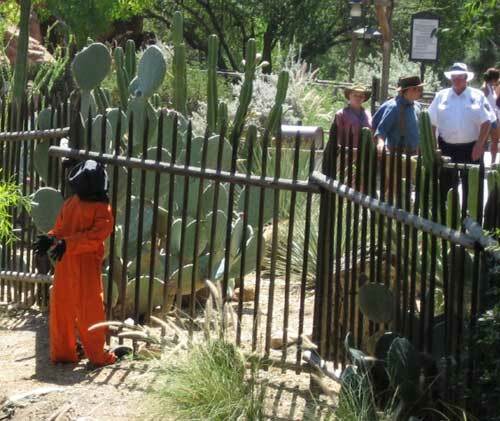 Burglars will only attempt to jump yucca plants one time. by Erik on 6/3/2008 @ 11:54am Sure would be nice if a "open space" were actually designed in a manner that might work in Tacoma. Here, this urban green area has not a single permeable edge. Its a left over green spot with dead edges. Little wonder it is a crime haven. Nature abhors a vacuum and this spot is a block from the jail. by Heather on 6/3/2008 @ 12:06pm Does it look like any of the fenced areas will have gates that could be opened during daylight hours? I suppose there will have to be some gates, as someone will need to get in there to mow. Thanks for the post, Kevin. We drove by there on evening, but I haven't walked through yet. I'll try to put my feet on that street sometime soon. Might be a good rest stop to add to a future f>>t bike route. by Erik Hanberg on 6/3/2008 @ 1:11pm @Kevin Nope! Whitney chased down that story and posted. @fredo - Touche. And I second NIN. "yucca plants hehe"
@morgan - I'm not a huge fan of the park, but there's not much green in the neighborhood. I'd rather see the two buildings across the street that are single story go way vertical.